I took August mostly off from things iPads & Apps (due to pure mushroom cloud overwhelm), and am easing back in with a single solitary app review (and by giving three local iPad workshops in the next two months, heh). Leo has been grooving on several different apps lately, but the most pleasant surprise came from PianoBall ($1.99), which we picked up at a discount thanks to its inclusion on the most recent Moms With Apps App Friday. 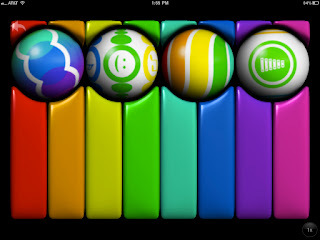 PianoBall is the kind of app I like to get for Leo, since he loves almost nothing better than musical free play with structural underpinnings, yet with a novel interface. Which is what PianoBall is all about! 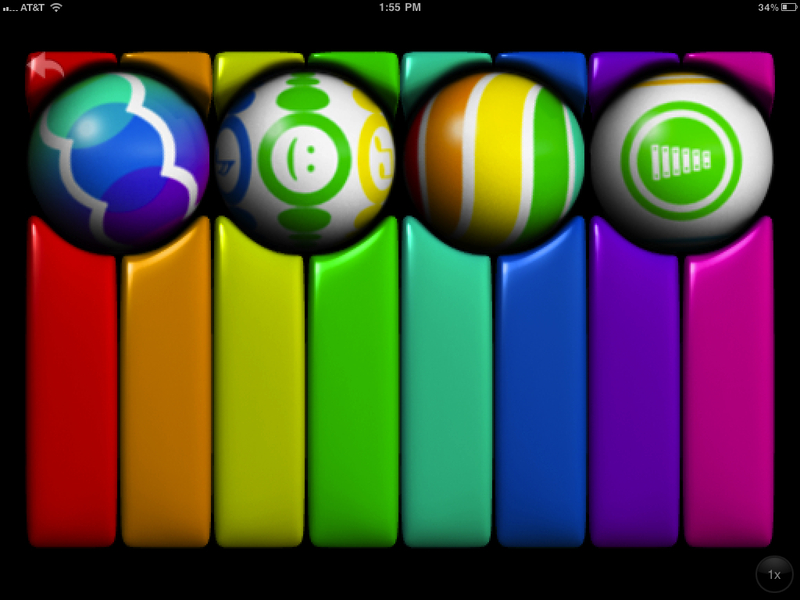 The first ball changes the keyboard to the ball's front color, and says that color out loud (oooh, learning!). The second lets you toggle the keyboard between plinking away on a standard keyboard, and tapping out a preset tune using any key, somewhat like Leos' beloved Tappy Tunes. The third turns the keys rainbow-colored, and lets you shift the spectrum around. The fourth changes the keyboard's instrument sound: keyboard, drums, saxophone, xylophone (pictured). The video below is Leo checking out PianoBall for the first time. Wackiness! And glee! He's been particularly unsettled lately, having a hard time focusing and sitting still -- so the minimal demands but spectacular results of PianoBall let him have exactly the kind of stress-free fun right he really needs right now. Thank you, Internet, MomsWithApps, and App Developers in general. You keep our boy so happy.